If you happen to have any items from the Cranleigh line, that you would be willing to photograph, so that they can be included in this web site, please e-mail us. 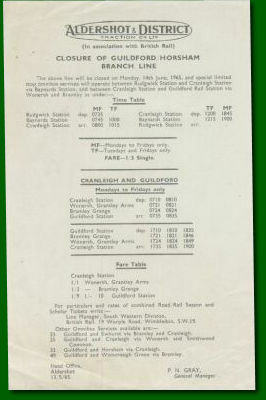 Notice, detailing the closure of the Guildford Horsham branch line and the replacement bus route from Rudgwick, through Baynards to Cranleigh. Conecting to the Cranleigh, Wonersh Grantly Arms, Bramley Grange and Guildford Station bus route. 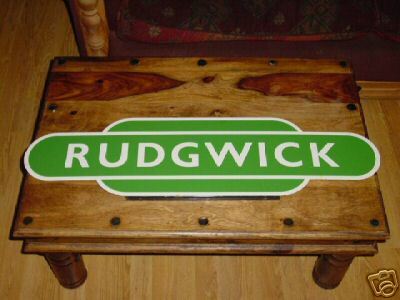 It was then discovered that it was a replica and not an original from the station. It was resold on eBay in April 2005 for £63.23. It could have been much worse, another fake totem was sold on eBay for £2,300!